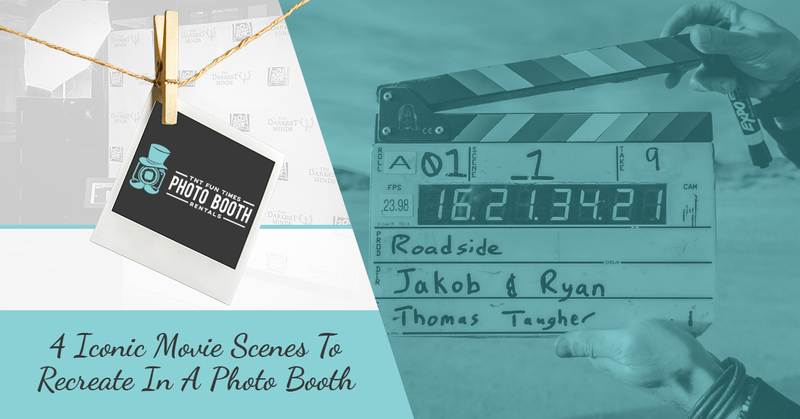 Photo Booth Rentals: Recreate These Famous Movie Scenes! Some movies are so iconic that they can be recognized by a single scene. Think Gerard Butler giving a kick in the chest to a Persian while screaming “THIS! IS! SPARTA!” Or who can forget the end of High School Musical when all the students do a big jump in the air as the credits roll? These iconic movie scenes have caused many a party-goer to recreate them in their own unique way. However, there’s only so much room inside of a photo booth, and if you kick your coworker square in the chest as he tries to enter the photobooth at the company holiday party, it might not go over too well. Thankfully, in today’s blog, TNT Fun Times is offering up four booth-friendly iconic movie scenes that you can recreate with ease. Check them out below! The oldest movie on this list contains one of the most iconic movie scenes in history that both children and adults will instantly recognize. Lady, an aristocratic pup who finds herself on the streets meets Tramp, a stray mutt. Before you know it, the two fall in love and are sharing a big plate of spaghetti and meatballs. Of course, as one often experiences when sharing a plate of spaghetti, an extra long noodle causes the two lovedogs to accidentally bump their noses together in perfect harmony! If you’re at an event that’s serving spaghetti, grab a plate and find your significant other, best friend, or budding office romance and bring them into the photo booth for a recreation of this iconic scene. Now that’s a bella notte if we’ve ever seen one! You can either do this one while getting your photo taken, or pop your head through the curtain and surprise the current occupants. All you need is a prop to drape over your head (a feather boa or a jacket will do), show your teeth in a nice Jack Nicholson grimace, put some crazy in your eyes, and give the camera a big ol’ heeeeeeere’s Johnny! We’ve all seen it. Some of us have even tried it in real life. Home Alone’s most iconic scene comes when a young Macaulay Culkin is left home alone (I know, shocking, right?). While trying to act like a real grown-up, the kid slaps his face with aftershave, just like Dad does. Unfortunately, his little cheeks cannot handle such a product, and he gives America a memorable hands-on-the-face open-mouthed scream. Come to think of it, it’s not unlike the famous Scream portrait by artist Edvard Munch, an image you can also recreate easily in a photo booth. While many of the above scenes are just that, scenes, the fist pump from The Breakfast Club is technically a still image. The iconic image of Brian throwing a triumphant fist in the air while walking across a football field is the closing image of the movie, and the camera pauses as it pans away from the school and the credits start rolling. With some sunglasses, tousled hair, and a trench coat you can perfectly recreate this iconic image in one of our photo booths. What Memories Will You Make In A Photo Booth? Photo booths are great places to make memories, and if you’re unsure how to pose, recreating a famous movie scene might be a perfect idea. If you’re looking for a way to liven up your next event, be sure to get one of our Atlanta photo booth rentals if you are in the area. For even more memories, choose our gif photo booth and leave with moving gifs of all the fun times from the party!